A beautiful, golden, juicy turkey is part of the holiday season. Unfortunately, a lot people also think that a golden, juicy, fried turkey is part of the holidays season as well. The problem is, if you don’t know what you are doing when you go to fry your turkey, things can go very badly very quickly. This happens when you put too much oil in the pot and it overflows when the turkey is put in. Hot oil bubbles and spills over the edge all over the place. This will either catch on fire or completely burn you if the oil hits you. Before you put oil in the pot, stick your turkey in and measure the amount of oil it takes to submerge your turkey. Once you know this measurement be sure to use just that much. This can probably be done with water but I’m worried that people would drop a wet turkey right into the pot (see #2). 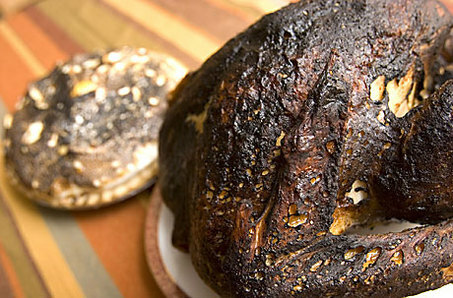 Caused By: Trying to fry a still frozen turkey, turkey with ice in the cavity, or excess water on the turkey. Water and burning hot oil don’t mix. If you’ve ever put water in a pan with hot oil you know how it spatters oil everywhere and makes some serious noise. Imagine an entire pot full of hot oil, a turkey, and ice or water going into it. 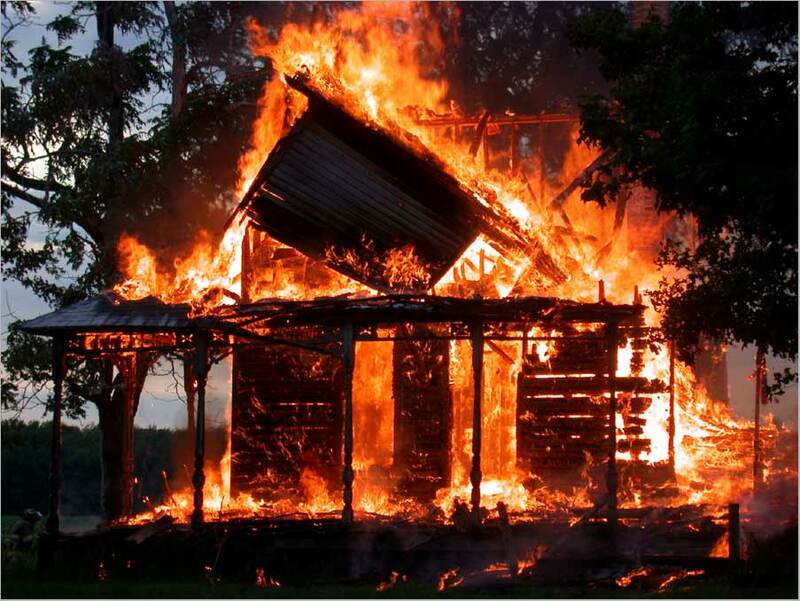 Caused By: Oil is too hot when the turkey goes in. Be sure to use a thermometer that works and is long enough to get an accurate reading. Alton Brown on the Food Network recommends getting the Turkey to 250 degrees and no more before putting the turkey into the oil. I saw him do this on Good Eats and it looked pretty safe. He also used a ladder contraption to lower the turkey into the oil to be extra safe however I think this idea might actually be far more dangerous by introducing even more ways to screw up. If you still want to try frying your Turkey after seeing all these, go right ahead. It still could be quite tasty and as long as you are smart and safe about it things should be ok.
Fry your turkey outdoors. This should be a no-brainer but don’t every attempt this in your house, that’s just silly. 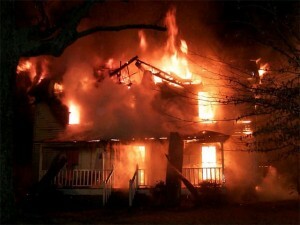 Don’t fry your turkey on a wooden or otherwise flammable porch, stairway, balcony etc. Try to find a level lawn area away from where children are playing. I don’t think a basketball into the hot oil will make anybody’s day. Try using a turkey fryer with four legs instead of three. I’ve tipped my entire Weber kettle grill over while it was full of hot charcoal because the damn thing has three legs and can be really unstable. I was lucky because hot coals extinguish with hose water pretty easily. Boiling, flaming, scalding oil doesn’t. Keep a fire extinguisher nearby. Most people probably won’t do this but I thought I should mention it anyways. I don’t even own one. Never leave the hot oil unattended. This might be hard to do as one person so if you do need to go grab a drink or walk around, just put somebody in charge of watching while you are away. Take it seriously. If you’re not sure how long to thaw your turkey ahead of time, shame on you because you should be brining it. However, according to the National Turkey Federation (bet you didn’t know they had one) you should thaw your turkey in the refrigerator and allow about 24 hours for every five pounds of bird thawed in the refrigerator. Hi, thanks for your comments on my blog! “Shame on you because you should be brining” – love it! Fried turkey is so delicious, but safety is always important. And the photo of the burnt skin is so sad. Great work! Hey Camille! Sure thing, love your work. Stay in touch! Ok so What if I cut the turkey up in quarters and fry each quarter separate in a tall stock pot, will I be able to fry it indoors? This should be far more safe since you aren’t working with as much oil and its more like frying chicken. However, please follow all the safety rules still. Make sure the Turkey is not frozen at all, wipe it down with paper towels to remove moisture, and be sure you know the temperature of the oil before you put it in!